I've had an on-again-off-again relationship with Launch Center Pro (Website)(iTunes). At a certain level this app really speaks to me. It has this remarkable ability to make iPhone apps do cool automation-style things despite the fact Apple has never been to sweet on the idea of inter-app communications in iOS. On the other hand it always felt just a little bit too fiddly for me and a little bit too slow in launching and operating for me. Also, because I use Drafts for so much, Launch Center Pro just never really stuck. This week the developer released a separate iPad version (iTunes) of the app which led me to go back and play with Launch Center Pro again. The app launches and operates faster than it ever did for me before. That may have more to do with my A7 iPhone 5S than anything else but the removal of that delay makes the app more interesting to me. 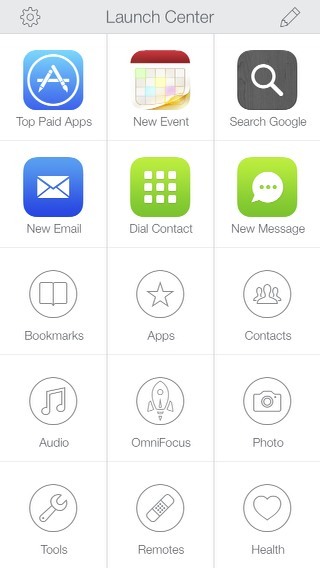 They've also cleaned up the interface and made setting up your Launch Center screens easier than before. I've been fiddling with it for a few days in my dock and this time it may just stick. I'm using it more as a platform for launching semi-important, non-home screen apps than anything else but I'm also adding some automation steps. It is not replacing Drafts but instead solving other problems. I'm going to leave it in my dock and report back in a few weeks.